K. H. Saw’s new Chyniis restaurant aims to sow greater interest in esoteric Chinese dishes especially those from Sabah. To know Malaysia is to love Malaysia, so it is said. But when it comes to food, I have to admit that I’m more well-versed in French and Italian cuisine than our own homegrown specialities, especially those from Sabah. However, enterprising restaurateur K. H. Saw is out to rectify this anomaly by getting Tawau-born chef Lim Ching Shiung, a.k.a. Chef Hoong, to entice us with his selection of hometown specialities at the newly opened Chyniis restaurant. Saw, whose successful restaurant venture began with the d’italiane kitchen in 2003, says that Chyniis will focus on communal specialities that have largely remained below the radar. A firm believer that the “food business is about creating a culture of excellence”, Saw says chefs are like artists and musicians — their creativity is translated into the food that they serve. “They must be free to express themselves. My chefs can buy and use any ingredient even if it is expensive. As long as we meet our quality standards, I’m fine with it, ” he says. “Customers who dine out expect a certain degree of specialty and refinement, so restaurants must be able to offer them consistency and quality. If we give diners fair value for money and assure them of a high level of food and service quality, they’d be happy to return,” Saw says. And that is exactly what he aims to deliver with his contemporary Chyniis restaurant. Decked in white, cream and timber tones, with accents in black and matt gold, the restaurant is stylish, but it’s the dishes with such unusual ingredients like cactus, moon flower and sea bird’s nest that take centrestage. 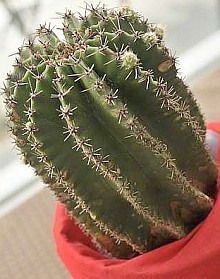 This spiky cactus is an ingredient in Tawau dishes. Feeling lost already? Never mind, you can rely on operations manager Joyce Chin to help you navigate the house specialities. I would recommend starting with the Kerabu Sea Bird’s Nest (RM16, small; RM26, large). 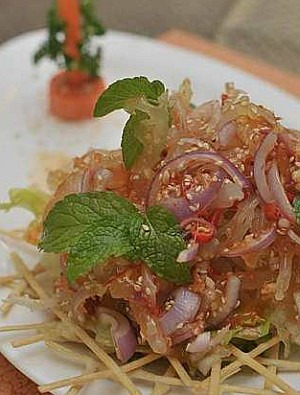 It’s a tangy and spicy salad that uses bird’s nest seaweed harvested from Sabah’s tropical waters. Rich in plant collagen, vitamins, calcium, iron, magnesium, potassium and phosphorus, this crunchy seaweed is said to be good for the skin. Inspired by the customary Chinese New Year offering of yee sang (raw fish salad), Chef Hoong’s Healthy Salad Platter (RM28, small; RM38, large) of fried yam strips, beetroot, carrot, lettuce, yam bean, dried mandarin peel, sweet potato, potato, bird’s nest seaweed, fresh coriander and laver should go down well with today’s increasingly health-conscious diners. Topped with crushed peanuts and black and white sesame seeds in a mildly sweet-sour plum dressing, the salad offers a multitude of refreshing flavours and contrasting textures. It left us asking for more. You don’t have to be a bizarre foodie to appreciate the signature Double-boiled Moon Flower with Chicken Soup (RM12 per person). The central ingredient here is the dried night-blooming cereus, a rare cactus flower imported from Sichuan, China. 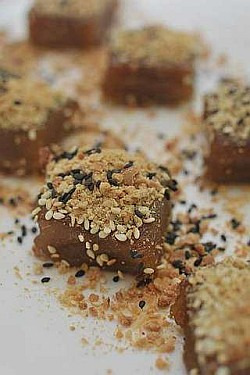 Steamed tapioca cake with black and white sesame seeds and crushed peanuts. In its reconstituted form, it tastes like char choy (Sichuan’s preserved vegetable). The rustic broth reminiscent of choy kon (dried bok choy) is said to be a “cooling” and energising tonic, purportedly efficacious against lymphatic ailments such as phlegm and bronchitis. Another esoteric item is the Cactus with Beancurd and Burdock (RM16, small; RM22, medium; RM30, large). Showing us the cactus plant brought in from Tawau, Chin explains that the dish is traditionally known as kai na tai kai chai (“mother hen bringing along chicks” in Cantonese). “The cactus is customarily sliced and stir-fried with beancurd, kei chi (wolfberries) and fresh burdock or double-boiled with Chinese herbs,” Saw informs. Smooth and tart with a slightly crunchy texture, the mineral and vitamin-rich cactus reputedly aids in slimming, improves blood circulation, reduces bad cholesterol and lowers one’s blood sugar level. Top marks go to the Chicken with Seafood Paste (RM40, half; RM80, whole chicken), a deceptively simple but scrumptious creation that underscores the chef’s skills. No less impressive is the Baked Giant River Prawns with Dong Gui and Butter (RM16 per 100gm, minimum two prawns per order). The prawn’s sweet flesh is deliciously accentuated by the dong gui (Chinese angelica) powder’s distinct herbal nuance. The crustaceans’ head, shell and legs are chock-full of flavour, so you’ll want to dirty your hands to get the best from the tasty morsels. If you’re big on crabs, then the Hot and Spicy Chilli Crabs (seasonal price) will prove irresistible. Its piquant sweet, sour and spicy sauce is best enjoyed with Chyniis’ Special Homemade Man Tau (RM1 each). Sweet treats to round off your meal with veer from standard offerings such as Water Chestnuts with Snow Fungus (RM5 per bowl) to the retro-inspired Steamed Tapioca Cake (RM12) with black and white sesame seeds and crushed peanuts. Overall, Chyniis warrants repeat visits — several of its gems have already generated a buzz in the food blogosphere.